What makes a film festival successful today? My first visit to Shanghai International Film Festival (SIFF) has made me wonder. SIFF celebrated its tenth anniversary in June, so I decided to check it out. Put simply, the week-long event that ran from the 16th to the 24th ticks all the boxes for a leading festival. It has prizes, film financing, a market, numerous forums and press conferences and stars – when I arrived this year, none of the volunteers knew what the opening night film was, but they all knew Sharon Stone would be there. However, although there are some discoveries to be made, the screenings are not so exciting. Yet, more guests attend from around the world every year, and more of those guests are repeats. Clearly, SIFF is a success. But why do the guests keep coming back if they are not discovering exciting new films? Shanghai’s success reveals the transformation of the film festival circuit today. In today’s congested film festival circuit, organisers are trying to make themselves stand out by adding value in as many other ways as they can. And SIFF demonstrates that those added values can be a major drawcard almost by themselves. In its effort to meet FIAPF’s standards, SIFF has been steadily showing more films, and adding more sections, awards and events. The film market was new this year. At the moment, only two Chinese companies are allowed to buy foreign films for release in China, and there is a limit of 40 films a year. So it is not surprising that not so many foreign companies turned up. This in turn limited the opportunities for the local companies trying to sell their films for export. But the organisers told me they believe the market will open up more in the future, and so they want to be ready for when that day comes. In the competition area, SIFF worked together with Shanghai University’s School of Film & Television to launch a student film competition, adding to the existing Jinjue (Golden Goblet) main prize, and the Asian New Talent award. The screenings were packed out and hugely popular, and the quality of the films was very strong too. The Best Student Film award went to the German film Schattenkind (Shadow Child), a brooding piece about coming to terms with a child’s death, by Hans Hege. The runaway audience favourite and winner of the Best Creative Award was Zhang Zhonghua’s hilarious Huojian Anchun (A Flying Quail Dream), about a schoolboy’s efforts to build a flying machine. SIFF initiated a “pitch and catch” film financing event, modelled on Pusan’s PPP, in its Forum section this year. 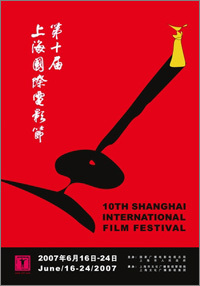 Unlike many other festivals, SIFF’s Forum events are not open to the public but only to festival guests The focus of many events on the practicalities of doing film business either in China or internationally helps to explain why they are also the most enthusiastically attended events of the festival. Among the highlights this year was a Film Festival Heads’ Summit attended by such luminaries as Geoff Gilmore of Sundance, Kim Dong-ho of Pusan, Marco Mueller of Venice, and Chuck Boller of Hawaii. Boller is one of the most regular SIFF attendees. He was first invited seven years ago: “So, I came over and just loved it – the people, the films, the undiscovered nature of it.” On the basis of his enthusiasm, he has come back every year and built a thriving and multi-dimensional partnership with SIFF. “Two years ago, I came with the Governor of Hawaii and 150 business and political leaders. We all walked on the opening night red carpet. The Governor of Hawaii was interviewed, and then he asked how many people saw that broadcast. They said 200 million households. That’s a minimum of 400 million people.” Clearly, the benefits of the partnership extend far beyond the festivals themselves. Last year, Shanghai used the partnership to send five different delegations across to Hawaii, to discuss topics ranging from film archiving, to student filmmaking, and co-productions. Film business is the major magnet for SIFF attendees. As Boller points out, “China is the happening place in the world right now. Everybody wants co-production. Everybody wants to break in.” After a long decline through the 1990s and into the new century, the film business is booming in China. Local box office has grown from US$197 million in 2004 to $340 million in 2006, and the country is adding at least 300 new screens every year. The Crowne Plaza is the festival hotel. Owned by the festival sponsors, the Shanghai Media and Entertainment Group (SMEG), it adjoins the main venue, the Shanghai Cinema City – also owned by SMEG – and is the festival headquarters for the duration of the event. There is only one entrance to the hotel, and right in front of it is the lobby café. As many festival guests have discovered, if they station themselves in the café, there’s a good chance that whoever they want to meet will eventually come through that entrance. “The one year we weren’t in this hotel, we immediately felt the lack of access”, said Chuck Boller, who also recalled the year a particularly annoying guest who exaggerated his connections was so permanently in the café that everyone was desperately trying to figure out how to exit or enter the hotel without going through the lobby! From a foreign visitor’s perspective, the main panorama selection is uninspiring. Many of the films have been screened overseas long ago. However, with so few foreign films being released in China each year, Paul de Carvalho of Fox Searchlight explained to me that Fox put films like The Last King of Scotland and Little Miss Sunshine into Shanghai’s Panorama precisely to give local audiences a chance to see them on the big screen. And the healthy box office for those screenings indicates local appreciation of the opportunity, even though everything is already available on pirate DVD. Foreign guests might be more interested in the new Chinese films. SIFF rounds up at least 30 every year. However, SIFF only accepts domestic films that have already been classified by the Beijing censors. By definition, this excludes all the independent films that foreign festivals love. These days, there are festivals that declare themselves against the elitism of other festivals and determined to show a representative range of films. For them, SIFF offers a sampling of more mainstream production. However, representative does not necessarily mean watchable. Sitting through Childhood of a Marshal (dir: An Zhanjun), a hagiography of dead (but not quite forgotten) Communist leader Zhu De’s childhood, I flashed back to the mid-1980s, when most of my work in Beijing involved subtitling propaganda films for the Chinese embassy circuit. Except back then, socialist leaders still had enough modesty to forbid anything that smacked of a leadership cult. At lunch afterwards, Stephen Cremin of Udine film festival and Derek Elley of Variety entered into an earnest discussion about the classification certificate numbers on the Chinese films. Had they missed certain films? Why did this film have that number? After a few minutes, they both realised how ridiculous it sounded. Cremin admitted this was a trainspotting moment. I saw it more as a sign of desperation. What else can you do when there’s nothing to say about the films themselves? Unwilling to become a Chinese film anorak, I started to ration my viewing. However, it would be wrong to suggest that there were no interesting new works among the mainstream Chinese films to be seen at SIFF. Younger Chinese filmmakers and producers are fully aware that independent production is a dead end as long as it continues to mean that they cannot screen in their own country. The government has relaxed regulations enough to allow independent companies to make films with no involvement from the old state-owned studios for some time now. Encouraged by this and the recent growth of the box office, producers are trying to find ways to make films that will both please both the censors and local audiences. For most, the budget required to make a martial arts blockbuster like Curse of the Golden Flowers is out of reach. And besides, that genre is getting a bit tired now. As a result, a range of more interesting lower budget mainstream work is beginning to appear. 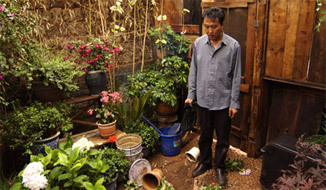 Wang Fen’s Xiangzi (The Case), which won the Students’ Choice Award at SIFF, is a good example. This film is also part of the Yunnan Film Project put together by woman producer Lola and featuring ten films all made by women directors from the People’s Republic, Hong Kong and Taiwan. At a SIFF press conference for the project, Lola emphasised the aim to make genre films with a twist – films that would appeal to audiences without compromising the filmmaker’s vision. The Case is a psychological thriller that brings a touch of Hitchcock’s sadistic humour to China’s new bourgeoisie. Middle-aged Dashang (Wu Gang) and his wife seem to have it made. They run a charming but remote inn in an idyllic mountain resort on the Lijiang River in Yunnan Province. But there is trouble in paradise. His wife is wildly jealous, and her brother, the local policeman, constantly threatens Dashang with retribution if he so much as looks at another woman. Then Dashang finds a suitcase floating down the river, full of frozen body parts. Just as he is trying to work out what to do about it, a strange couple arrive and check in. The husband (Jia Zhang-ke regular, Wang Hongwei) is as jealous as Dashang’s wife, but the wife (Wang Sifei) is young and alluring, and seems to have designs on Dashang. In this case, the female perspective definitely adds to the film. Wang Fen was not only a documentarian before but also a model. Instead of simply identifying with the protagonist, the film develops its own ironically distanced angle on the kind of man who falls for a siren. Another first-time feature director with an interesting biography is former fireman Yang Shupeng, whose Fenghuo (Cold Flame) has been produced by another small independent company, Infotainment China. Cold Flame takes a well-established genre in the Chinese market, the war film set during the Anti-Japanese War of Resistance (1937-45). But instead of focusing on the battlefield, Yang looks at the effect on the psychology of some children left behind, and in particular a teenage girl called Jingxuan (Michelle Gong). Although she is entrusted with looking after her little brother, she is also a pathological liar. The film is distinguished by handheld camerawork and zooms. At first annoying, these quickly come together to form a distinctive and effective means of rendering character psychology and emotional shock. An unexpected pleasure was Jin Chen’s Mini. This romance is a vehicle for Angelica Lee and Chinese cinema’s favourite male heartthrob, Liu Ye. She plays a circus performer called Mini, who has been kept away from boys by a family determined that she will become a star. He plays a video store salesman – the typical tall, dark, handsome but unsuitable boyfriend beloved of Harlequin novels. At first sight, the film did not promise much. But it is adapted from a novel by Wang Anyi, and the female perspective rendered in voiceover gives the pretty female lead an edge of desperation and ultimately perversity that makes this more than just a doomed love story. Moving out of the mainstream, but still in the realm of films passed by the censor, Hasi Chaolu’s Guatoujiang (The Old Barber) crosses the borders between fiction and documentary by having the old man of the title play himself. The result is a charming but not cloying depiction of dying traditions set around the lakes behind the Forbidden Palace in central Beijing. Now that the rest of the city has been demolished in an effort to rebuild it as a bad replica of Dallas before the Olympics, everyone has begun to value this remaining heritage neighbourhood and everything it stands for. The old barber and his way of working and living symbolise this. Last but certainly not least, there was Sheng Zhimin’s Fusheng (Bliss). Like Ning Hao’s breakout hit comedy, Crazy Stone, it is set in Chongqing (a.k.a. 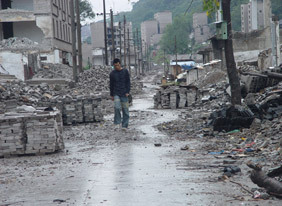 Chungking), China’s inland megalopolis in Sichuan Province. Why are interesting films suddenly appearing from places like Sichuan and Yunnan, far from either today’s film capital of Beijing or any of the sites of major studios in the past? Unlike Crazy Stone, Bliss is not a comedy. Instead, it is a subtly observed drama about a retired policeman, Lao Li (He Xingquan), and the other members of his not very functional family. These include his second wife’s son, a delinquent sliding into full-on criminality; his own son, a cab driver scarred by his mother’s abandonment of the family; and his daughter-in-law, recently laid off from her job and stifled by her insecure husband who fears she will leave him like his mother did. The film interweaves the personal and the social, evoking sympathy for the family’s efforts to ride the waves of China’s transformation. Bliss could all too easily have slid into melodrama, but opts for underplaying that is more engaging and thoughtful. Bliss also won the Asian New Talent award at SIFF. (The Jinjue award in the main competition went to the German film, Frei nach Plan [According to the Plan], directed by Franziska Meletzky). Although no one would dispute the quality of Bliss, the award to Bliss provoked some grumblings among those who understood FIAPF’s A-list rules to bar an A-list festival from including in competition a film that has already screened at international film festivals outside its own country. I certainly cannot judge the question of Bliss’ eligibility. But I would like to return to the very quality that SIFF’s organisers are so proud of – its A-list status. Geoff Gilmore of Sundance used his speech at the Forum to lambast both FIAPF and the A-list status, accusing it of shutting out non-European festivals and promoting mediocrity. Other festival guests argued that the price to be paid for A-list membership was too high, and that it was one of the main factors behind SIFF’s lacklustre competition films. Imagine you are the producer of a hot new film. Because of FIAPF’s rules, you have one shot only at an A-list competition. Where would you like to send it to? Cannes? Berlin? No, let’s send it to Shanghai this year. I don’t think so. Some guests told me they felt Shanghai’s main competition attracts the films whose producers know they are not good enough to make it in the more established competitions. It is a competition of also-rans. This problem is compounded by the festival’s unique selection procedures. It may come as a pleasant surprise to many readers to learn that, as Shen Yang pointed out to me, SIFF is exempt from censorship. The Censorship Committee of the Film Bureau in Beijing does not have to approve its selection. Shen Yang believes SIFF’s procedures “are extremely fair and transparent.” She explains, “When we began we had a group of experts, composed of critics, university professors, and also film directors. Out of this we organised a selection committee. Other festivals send curators out to select films. All the films we choose have been submitted to us, and are selected by our group of experts.” This may be fair. It may also avoid any individual having to take the rap should the festival’s programming ever annoy the authorities. But it also means the festival is not chasing films in a manner that would make its selection distinctive. SIFF has achieved a lot in its ten years. It has put all the elements of an A-list festival in place. But Shen Yang and her colleagues are well aware that each of those elements needs further improvements, as does the overall running of the festival. To date, the weakest element remains the film selection. Strange though it may seem, SIFF has proved that this need not be a barrier to success in today’s film festival world. But in the longer term, if it really wants to attain its ambition of reaching the level of major festivals like Berlin, this state of affairs will need to be addressed.